We needed to fit a new exhaust tip. 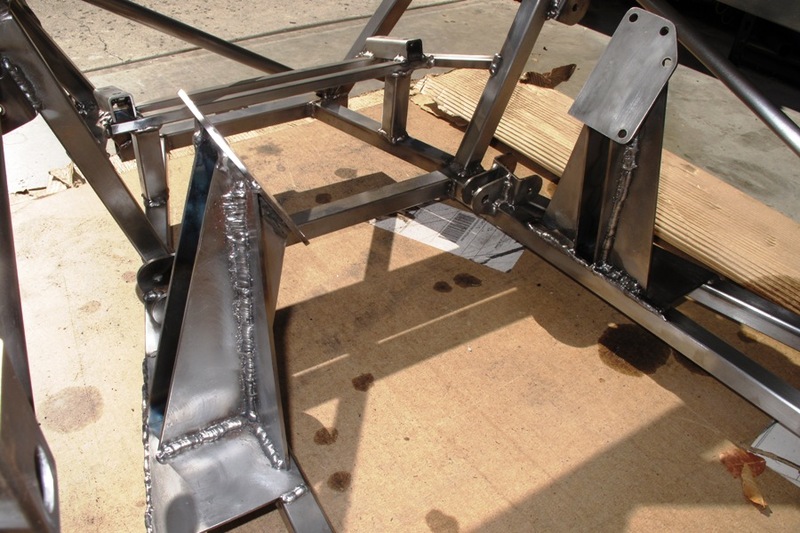 Our old one was made out of cheap aluminized steel with a poorly-formed 90-degree bend. Our new one is made out of expensive aluminized steel with a real mandrel bend. The reason for switching was not looks, however, although the new tip does look pretty boss, but clearance, specifically with the rear fender. We're not 100% sure how big our rear fender is going to be, but 30" rings a bell, and the cheap exhaust tip was only 14-3/4" from the center of the rear tire. According to our math, we would need at least 15". The new tip gives us 16-1/4", which we calculate is more. It occurs to us, after spending some time with our exhaust, that automotive exhaust systems are not generally designed to look pretty, because the vast majority of them are buried underneath the car where they're essentially invisible. 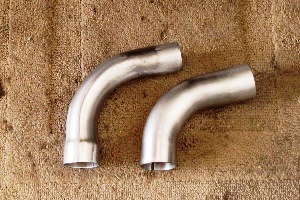 So it makes sense that the people who manufacture exhaust parts are not terribly concerned with how the pieces look. Which is unfortunate because our exhaust sits on the side of the car, out there for everyone to see, looking kind of Disneyesque (i.e. Mickey Mouse) with its oddly shaped pipes and ugly welds. What we'd like to have is a nice one-piece chrome or polished stainless steel exhaust, sleek and streamlined, with an integral muffler, tuned runners, and beautiful flowing curves front to back. Of course we'd also like 300 horsepower and a four-car garage, but we're not likely to get those, either. The best we can do for now is chalk this one up to experience, our first exhaust system. We're happy that it fits on the car, and we'll be happier still if it turns out it doesn't leak. I think we may have found the limit on our Millermatic 140 welder. That limit is 9. 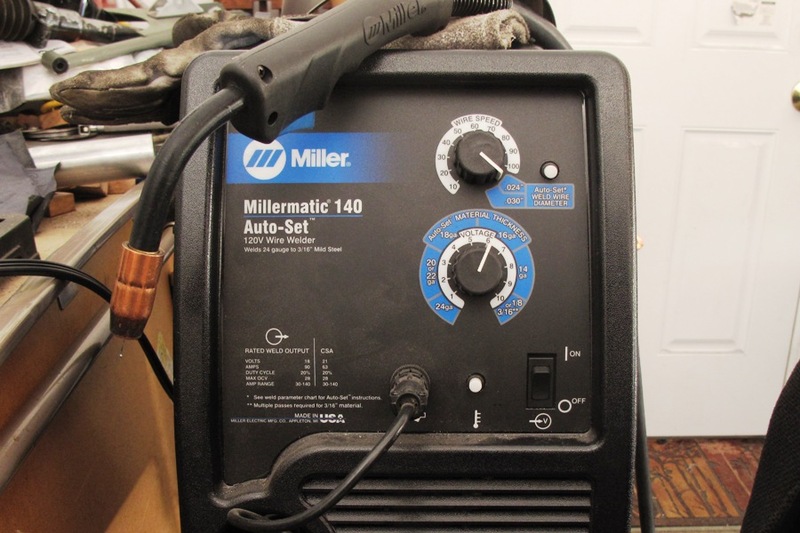 The welder has settings from 1 to 10, depending on how thick your metal is. A higher number uses more current and the welding wire comes out faster. For 16 gauge, which is mostly what you weld on a Locost, we set it to 6. We're accustomed to how the welder feels at 6. 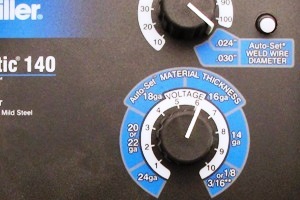 We turn it up to 7 when welding 16 gauge to 1/8". It runs a little hotter, but feels about the same. For 20 gauge we turn the welder down to 3. It runs really quiet and the wire speed slows way down. 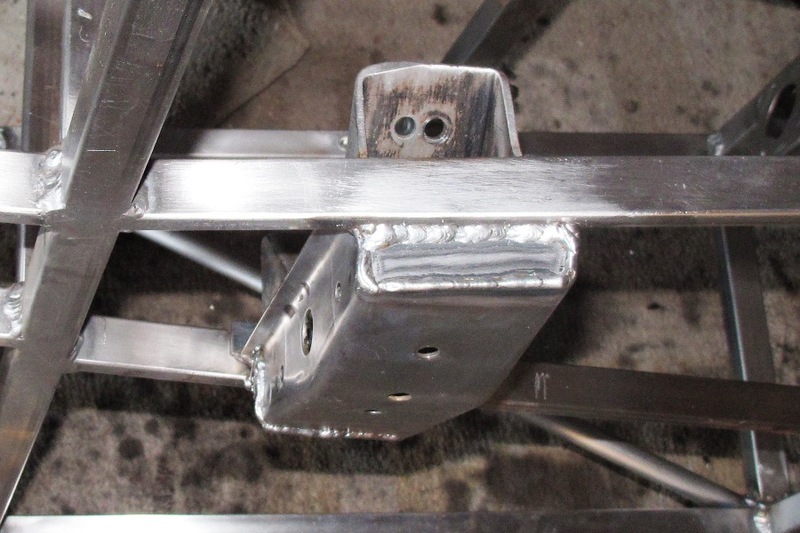 We had to weld up the motor mounts that we tacked together earlier, and since they're all 1/8" steel we turned the welder up to 9. It welded the pieces okay, but it wasn't happy about it. You could hear the spool of wire spinning inside the machine, and with that kind of wire speed it was hard to keep the arc steady, like trying to keep the gimbals centered during a manual LEM fire in Apollo 13. You can do it, but you get wire spatter everywhere, and if you keep a weld going for more than 15-20 seconds, you can expect to blow a few circuit breakers in the house. So 9 is just about the limit. If you plan to do a lot of welding at 9, get some thicker wire. It'll feed slower, and allow you to maintain a steadier arc. Also, turn everything off inside the house. We're using .023" wire, which works fine at 6 and even 7, but if you want to go all the way to 9, or even 10 if you've got an awesome set of circuit breakers, you really need to move up to .030" wire. 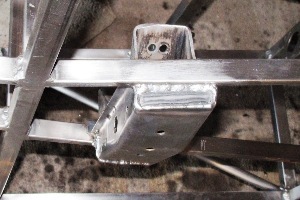 I wish we'd known that when we welded the rear suspension brackets to the axle housing. We welded those at 9, and if you'll recall it wasn't pretty. The motor mounts are now equally pleasant looking. At least they'll be nice and strong. We used to worry that they might fall over. Now it looks like they'll support a Cummins diesel. Another example of our fine attention to overkill. The transmission mount is a little more reasonably sized, mostly because we used the mount out of the M.G. It's welded on either end to the lower transmission tunnel rails, and since the rails are 16 gauge steel, we got to do that part with the welder set to 7. So it almost looks normal. We're moving on now to some welding that should be a little more fun, attaching all the sheet metal panels. These will all be welded at 6 and under, and our main goal with the panels is not to warp anything so badly that it shows up in photographs. We'll see how that works out.